For the price of admission to Antoni Gaudi’s legendary La Sagrada Familia, you can buy yourself a decent sit-down three-course lunch, reserve a bed in any number of top-rated hostels, or go to any number of art-house cinemas and buy a ticket for you and friend, plus have money leftover for snacks. What I’m getting at is that it’s damn expensive to enter a building still at least a decade away from completion. Although I have mostly approached this trip with the mindset of “I might never come back here again,” I feel that Barcelona is a city I could visit time after time without exhausting myself. So entering La Sagrada Familia will just have to wait–but luckily there are a host of other incredible places around the city to see art, most of them much cheaper, if not free. 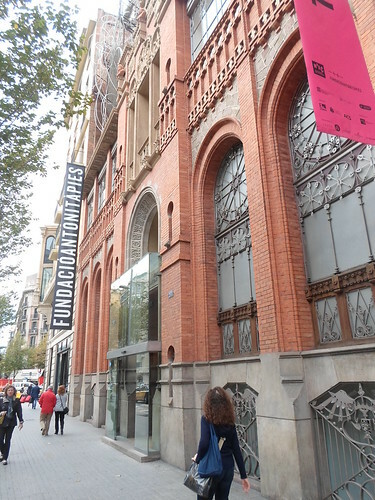 For starters, there’s the Fundacio Antoni Tapies, a museum that displays the works of one of Catalunya’s lesser known but no less brilliant 20th century artists. You’ve probably never heard of him; even I, an art history major, only knew about him because I stumbled across his work while writing a paper on post-WWII art. His philosophy–and his art–can be summarized like this: In the aftermath of totally destructive war, the entire foundation for Western thought is literally and metaphysically destroyed. So art must be remade from this rubble, and the ideas we used to have about what constituted beauty, truth, and nature must also be refashioned in the same way to view art and the world itself. 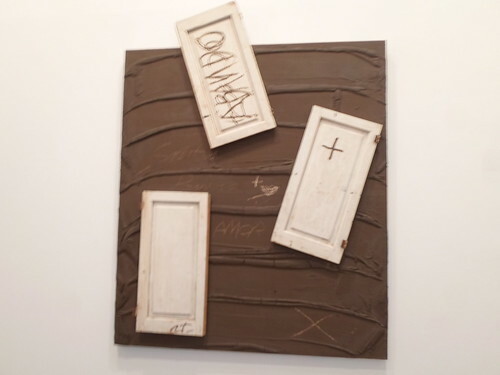 Before I get completely sidetracked and ramble on about the destructive nature of mankind, let me get back to the point I was originally trying to make: admission to the Fundacio Antoni Tapies is just under 5 euros with a student ID card. And you can bet your life I still have mine. 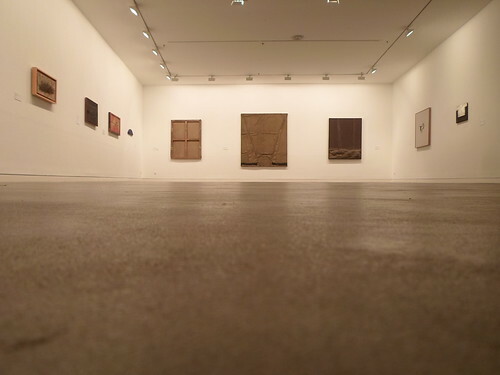 If you’d like to learn more about Antoni Tapies, check out this really informative artist bio page on Artsy. Of course, if you know what you’re doing and where you’re going, art doesn’t have to cost you anything to see. 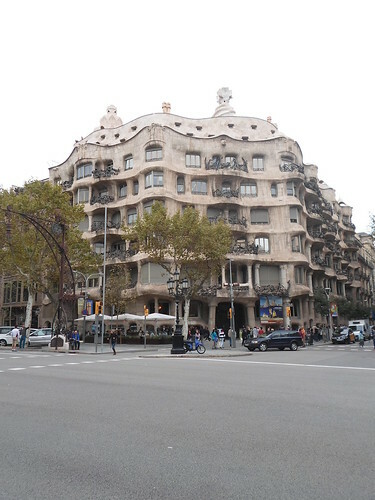 Take La Pedrera, a typically whimsical Gaudi creation that is probably one of the most exclusive apartment buildings in the world. Not only is it located on the chic Passeig de Gracia, but because of its unique design (not to mention architect), not two apartments are exactly alike. My guess is that when Frank Gehry designed 8 Spruce Street, Manhattan he probably had the same idea in mind. The greatest artists–and architects–tend to steal without inhibition. Speaking of stealing, within the last month Barcelona started charging people admission to Parc Guell, previously free to the public. It must be a travesty to the people of Barcelona that a place so grounded in the mystique of this city should cost money. But fear not, fellow cheap travelers! 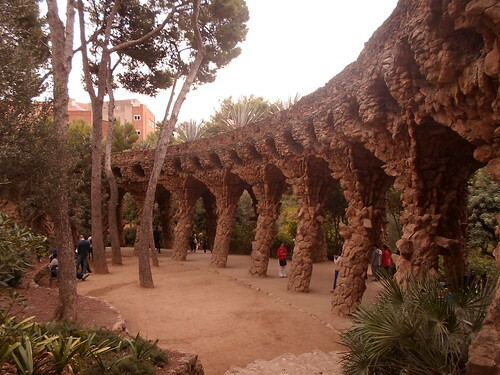 Parc Guell has multiple entrances, and not all of them are closely guarded. Despite being a head taller than everyone else, I calmly walked in with a group of Japanese tourists, and the guard nearby was none the wiser. For my sneakiness I was rewarded with a glorious view of the city; it reminded me a lot of when I climbed up Montmartre and all of Paris opened up before me. Likewise, the city below–including La Sagrada Familia, whose towers are almost as high as the top of Parc Guell–and the Mediterranean beyond were visible. It’s nice to go full circle in a single blog post, so let’s return to La Sagrada Familia for a second. I mentioned that I did not enter the church, but they haven’t found a way to charge people to look at the outside. Look might not be the right word to describe what happens when you’re standing below it and straining your neck to see it. The multiple facades of La Sagrada Familia are a visual feast for the eyes, and they contain an overwhelming collection of beautiful and evocative sculpture. On the East end of things is the Nativity facade, featuring lots of fanciful Gaudi sculptures all cooing over baby Jesus. 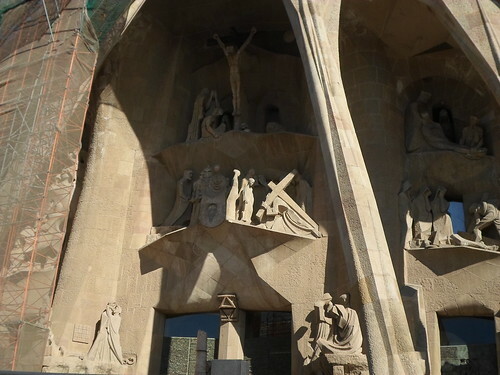 But for me, the most compelling artwork to be seen at La Sagrada Familia is the West facade that tells the story of the Passion of Christ. Even to the untrained eye, it’s clear that something very different is going on when compared to the style of the Nativity facade. This stylistic deviation is in part because a different artist, Josep Maria Subirachs, lead a team of sculptors to create a brutal, austere telling of the events leading up to the Crucifixion. Despite the horde of tourists who cluster around the base of the church, the magnitude of Subirachs’ sculpture is enough to transcend the constant flow of movement and noise that surround you as you take it all in. You simply cannot put a price on that. 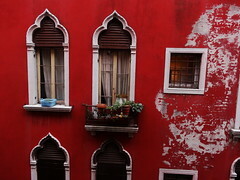 Posted in UncategorizedTagged architecture, art, Barcelona, painting, sculpture, travelBookmark the permalink. Indeed, in 2010 it was a fee of 20 euros to visit La Sagrada Familia…so I chose with half of the amount to see L’aquarium Barcelona…another kind of art. Wise choice Dana. As much as I absolutely want to see La Sagrada Familia, I’m simply not in a position to pay that much (it’s 15 euro now) to go. And as this post makes clear, there are more than enough ways to get your art fix without going broke. 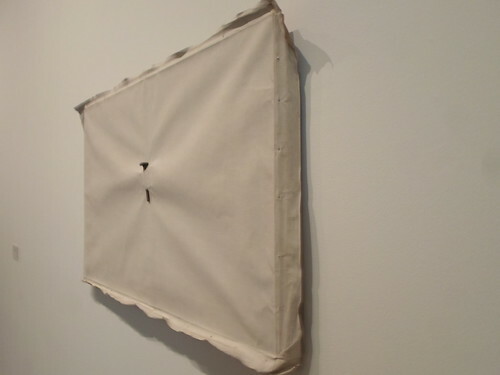 But most importantly–and this is something I haven’t explicitly brought up yet–is that art is becoming more and more inaccessible to the public. It’s a travesty that art is gradually becoming something reserved for only the wealthy, educated few, especially when you consider that it wasn’t always that way. Of course, there are some exceptions to this–the Met in NYC offers suggested admission prices, and a lot of museums in Europe, such as the Prado in Spain, have free viewing times. If art becomes limited to the wealthy and the masses no longer have anything to do with its creation or its viewing, it will be dead. Sorry for rambling–it really touches a nerve in me! I was very surprised to see no charge to visit The British Museum… if it’s up to me, it must be a fee… but everyone with their own rule, right? The British have managed to keep their national treasures (or in the case of the British Museum, Greece and Egypt’s) free from the same commercialization that has tainted much of Spain’s national patrimony. Do tell me more about Romania though–it’s not in the Schengen zone so there’s a good chance I could end up there at some point! The family is coming over for shabbat dinner tonight. Wish you were here. We miss you. Ay tia, no me torturas! I miss you all as well. Shabbat Shalom! They even make you pay to get in the Park Guell now???? That’s ridiculous. Yeah, I was there about a year and a half ago, and I felt like everyone was trying to sell me something. It was a beautiful city, but it wasn’t nearly as welcoming as many of the places that I visited in Northern Spain! hehe perhaps a little biased, given where you mostly resided. 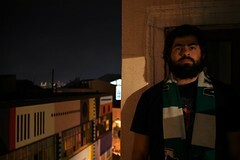 But yes, the level of commercialism is jaw dropping, and I think the Galician people are a little more reserved so hustling people on the street usually won’t work. ” If art becomes limited to the wealthy and the masses no longer have anything to do with its creation or its viewing, it will be dead. ” Bravo, Nathan. I was skyping with my parents earlier this evening about how it costs so much now to enter these places, and my dad rightly pointed out that the government here has to make money somehow–better off of rich tourists than the people themselves. Still though, I think the Spanish would be ashamed to know that after my month in France I can say with 100% certainty that the French have a much greater populist spirit with regard to the art. Being able to visit Notre Dame, St. Denis, Sens, Auxerre, Chartres, Bourges, Vezelay, Saint Sever, and pay nothing, versus having to pay 5 euro in Burgos and another 6 in Leon speaks volumes about how a culture views its patrimony. I agree, Nathan. Barcelona has become very commercialised and a theme park caricature of itself around the best-known attractions. The stark reality is that with 25m unemployed in Spain and an imposed austerity over the last 4 years, tourism has become a bandwaggon everyone is climbing on and there are ever more visitors coming from Asia, Eastern Europe, etc. However, as you say, there are plenty of opportunities to soak up art and design away from the tourist traps and to enjoy a host of cutural and popular events, so keep coming, folks. Not that I think the hawkers and hustlers are in the wrong–I realize they have nowhere else to turn to and need to get by; it’s just that the overall ambiance of the city suffers for it. Also, thanks for coming by my blog–I’m glad I found yours, wish I had known about it a few days ago when I first showed up! No disagreement from me, Curt–it is gorgeous. But for a city like Barcelona that is teeming with beautiful art, it’s not the only rodeo in town. My other concern is that with so many people inside, it turns into something closer to Disneyland. That was my problem with Notre Dame in Paris–the ambiance completely changes when you have crowds of people milling around all the time.